Our knowledge to model, design, analyse, maintain, manage and predict the life-cycle performance of infrastructure systems is continually growing. However, the complexity of these systems continues to increase and an integrated approach is necessary to understand the effect of technological, environmental, economic, social, and political interactions on the life-cycle performance of engineering infrastructure. In order to accomplish this, methods have to be developed to systematically analyse structure and infrastructure systems, and models have to be formulated for evaluating and comparing the risks and benefits associated with various alternatives. Civil engineers must maximize the life-cycle benefits of these systems to serve the needs of our society by selecting the best balance of the safety, economy, resilience and sustainability requirements despite imperfect information and knowledge. Within the context of this book, the necessary concepts are introduced and illustrated with applications to civil and marine structures. This book is intended for an audience of researchers and practitioners world‐wide with a background in civil and marine engineering, as well as people working in infrastructure maintenance, management, cost and optimization analysis. 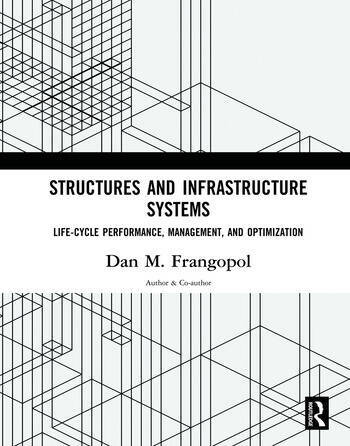 The chapters originally published as articles in Structure and Infrastructure Engineering. Frangopol, D.M., and Bocchini, P.
Frangopol, D.M., and Soliman, M.
Frangopol, D.M., Dong, Y., and Sabatino, S.
Furuta, H., Kameda.T., Nakahara, K., Takahashi, Y., and Frangopol, D. M.
Frangopol, D.M., and Liu, M.
Sabatino, S., Frangopol, D.M., and Dong, Y.
Kim, S., and Frangopol, D.M. Biondini, F., and Frangopol, D.M. Akiyama, M., Frangopol, D.M., and Suzuki, M.
Kwon, K., Frangopol, D.M., and Kim, S.
Lim, S., Akiyama, M., Frangopol, D.M., and Jiang, H.
Akiyama, M., Frangopol, D.M., and Takenaka, S.
Furuta, H., Frangopol, D.M., and Nakatsu, K.
Akiyama, M., and Frangopol, D.M. Akiyama, M., Frangopol, D.M., and Mizuno, K.
Dong, Y., and Frangopol, D.M. Messervey, T.B., Frangopol, D.M., and Casciati, S.
Okasha, N.M., and Frangopol, D.M. Catbas, F.N., Gul, M., Gokce, H. B., Zaurin, R., Frangopol, D.M., and Grimmelsman, K.
Ghosn, M., Moses, F., and Frangopol, D.M. Zhu, B., and Frangopol, D.M. Professor Dan M. Frangopol is the inaugural holder of the Fazlur R. Khan Endowed Chair of Structural Engineering and Architecture at Lehigh University. He has authored/co-authored over 350 articles in archival journals including 9 prize winning papers. He is the Founding Editor of Structure and Infrastructure Engineering and of the Book Series Structures and Infrastructures. He is a foreign member of the Academia Europaea and of the Royal Academy of Belgium, an Honorary Member of the Romanian Academy, and a Distinguished Member of ASCE.